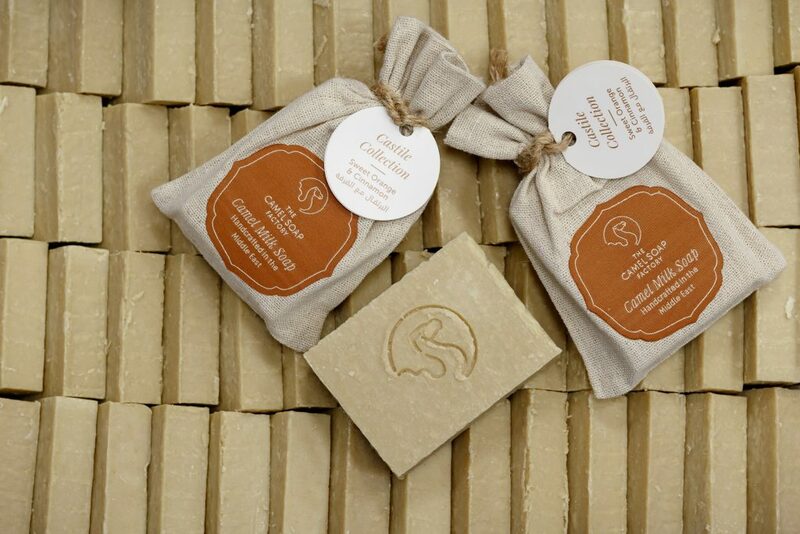 Mehak Srivastava speaks to Stevi Lowmass and Dave Esmonde-White of The Camel Soap Factory, discovering the art and their passion behind the handcrafted soaps. Contented work environments are a rarity slowly getting lost in the corporate rush of Dubai. However, step into The Camel Soap Factory, and you will soon be whistling a happy tune as you swing about in the relaxed ambience, amid scents like lavender and oud. But dont mistake the laidback atmosphere for a simple business; bubbling beneath is a clockwork set of procedures, determined to deliver the perfect product every time. The soaps are handmade by the lot through the cold process, and from their humble beginnings in a home kitchen, have today evolved into the result of a large-scale production line process. Yet, it is all done by hand. Marketing manager Dave Esmonde-White, with owner and founder, Stevi Lowmass. Deriving their name from the core ingredient, camel milk, the factory today uses up nearly a tonne of fresh milk every week, sourced from Al Ain Dairy farms. The milk is stored in the freezer, with batches taken out as per the production requirements. Other key ingredients include lye, olive oil, shea butter, and essential aromatic oils. Lowmass began selling small batches of the soaps in 2012, starting out from a Christmas market where sales exceeded expectations. It was then that she decided to get into licensed trade and to launch a dedicated soap making factory. On being queried as to why camel milk was chosen as the primary ingredient, Lowmass highlights that the resulting properties of the milk make them highly favourable amongst customers. While the milk was initially sourced from Camelicious, a renowned camel milk dairy brand based in Dubai, Lowmass decided to shift to Al Ain Dairy once production requirements grew. Lowmass highlights how on a visit to the farms, she came face to face with happy, pampered camels, which she believes trickles down to the quality of milk they produce. Lowmass emphasises that the soap-making process is indeed quite simple once all the ingredients are in place. Several of the other ingredients are sourced from outside Dubaifor instance, the olive oil comes in from Spain, while the shea butter is from Africa. The production equipment was previously brought in from the UK from a specialist manufacturer, but Lowmass mentions that recently they were able to find local companies that made the equipment as per specifications. The inner workings of the factory reveal exactly that. Workers in overalls, gloves, hairnets, and respirators (just a precautionary measure, since they breathe in any emitted gases all day, points out White) bustle around the production space. While a few clean and set up the box-shaped casts for pouring in the soap, another set works on lining the moulds with parchment paper and grease the insides with coconut oil. The production manager gets busy heating the oils on a burner in open pots, allowing solid oils like shea butter time to gently melt, but not enough to boil them. The lye solution, on the other hand, is mixed with the camel milk in the lye tanks and then the appropriate quantity is decanted into the mixing vats with the oils, in a process known as saponification. Essential oils are added, depending on the requirements of the batch. 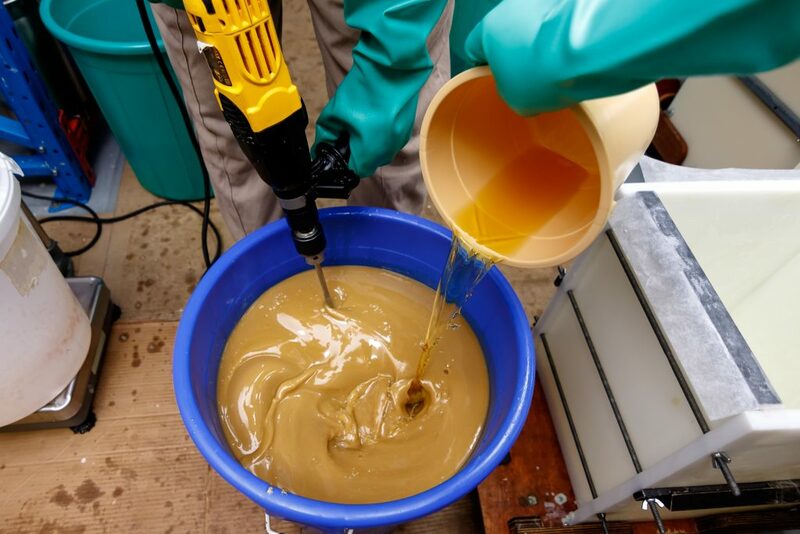 The resulting liquid is poured into the moulds and set aside for cooling. 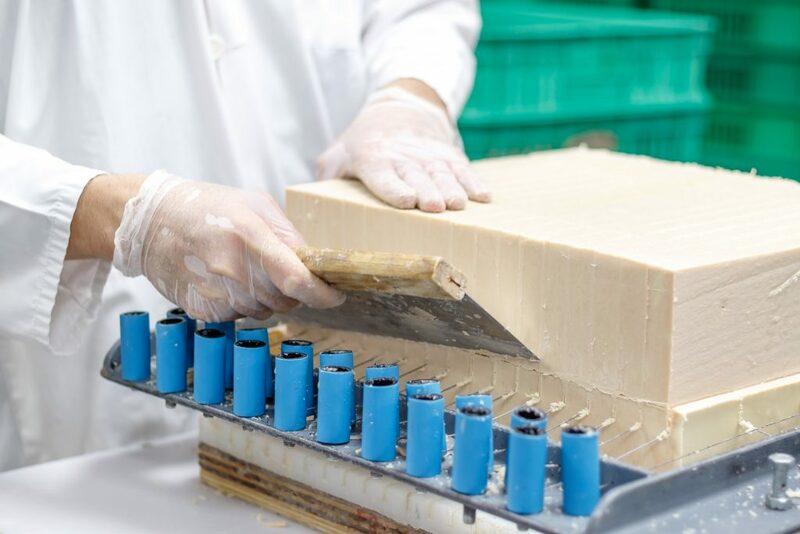 Once cooled and solidified, the soaps are hand-cut into bars using a specialised cutter, packed into plastic crates, and placed in a ventilated space for curing. 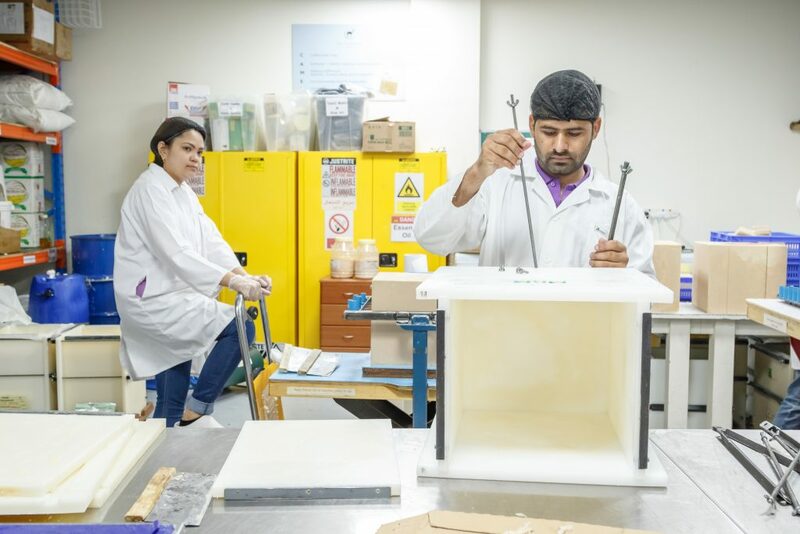 This part of the soap making process is the one that takes the longestnearly four to six weeks, which is why customised orders have to be placed well in advance. Watch: The soap-making process at The Camel Soap Factory. This week alone we made 50 batches, remarks White. Which is approximately 16,000 bars of soaparound 160 tonnes. Any excessive remains of the soap, for instance shavings or offcuts post the cutting process, are boxed and later used to make specialised, exfoliating soapsnearly no waste is produced when it comes to the soap itself. The company has also expanded its product range to include moisturisers and lip balms, all containing camel milk. 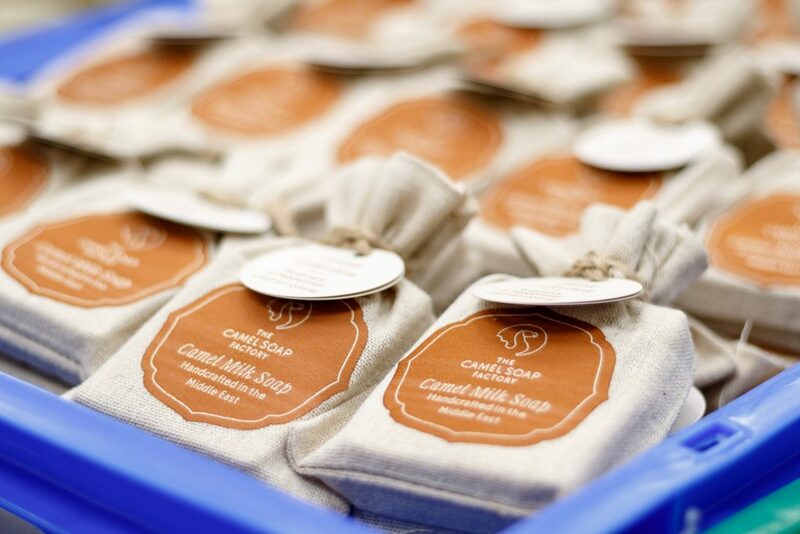 The soap is hand-stamped with the company logo (around two weeks into the curing stage). 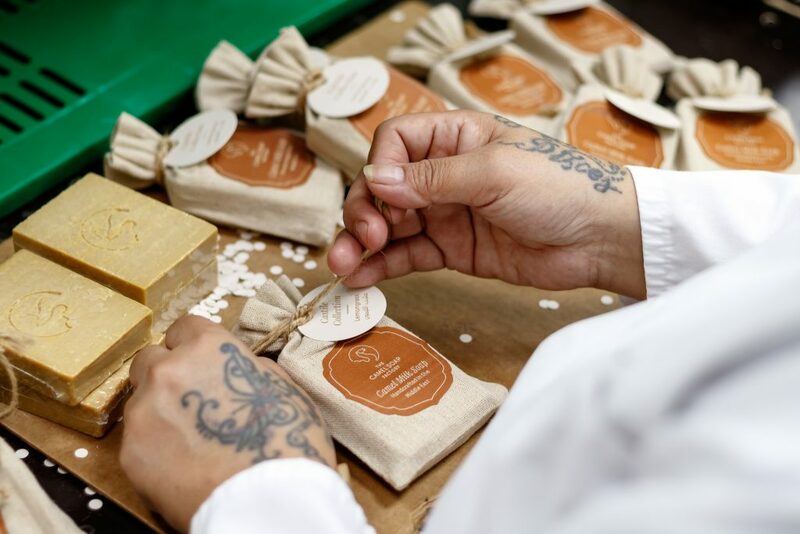 Post curing, the finished soaps are painstakingly hand-packaged, first with shrink-wrap, to protect them from elements, and then into the brands signature jute packs. Great attention is paid to how the soaps are packed, and these are then segregated into boxes of 50, which go into boxes of 300 for export. A long time ago, when I first entered the market with my soaps, I would pack them in beautiful tissue paper, with a little label on top, reminisces Lowmass. I went to sell the soaps at a market at a school, and somebody accidentally set the sprinkler system off, and I lost all my stock that night. It wasnt a lot [of stock] as compared to what I make today, but I was heartbroken all the same because it was everything that I had made. Thats when I realised that I need to change my packaging and I wanted to get packaging that I thought reflected the brand. The company utilises both their own delivery fleet as well as fetchr, DHL, and other freight forwarders for deliveries. Lowmass takes great pride in her employees and points out that theyve hardly had anyone leave. Lowmass trained with master soap maker Melinda Coss in London, the author of The Handmade Soap Book, and she subsequently trained her team in the ways of soap making. She points out that there isnt really a school or university to hone the art of soap making. White adds: Its a bit like cooking. You measure your ingredients, you ensure you use quality ingredients, and its the same with making soap. 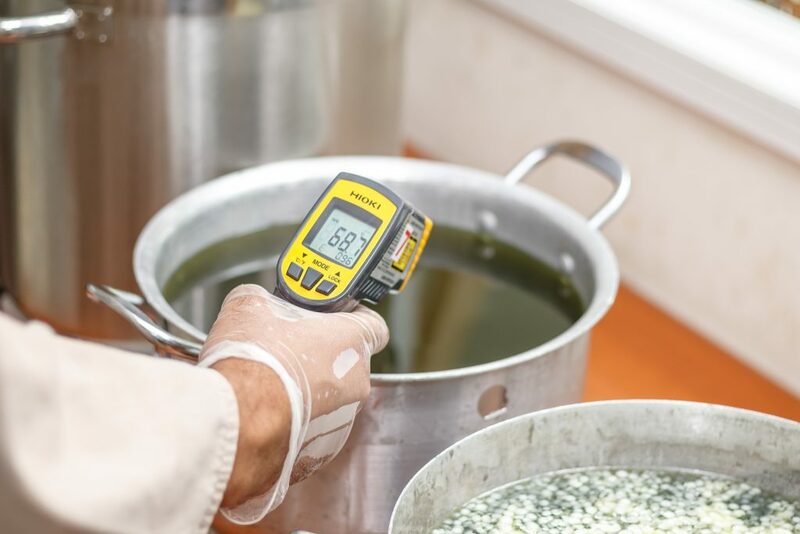 We ensure we source the best ingredients and move according to a recipe. Its stunningly simple. 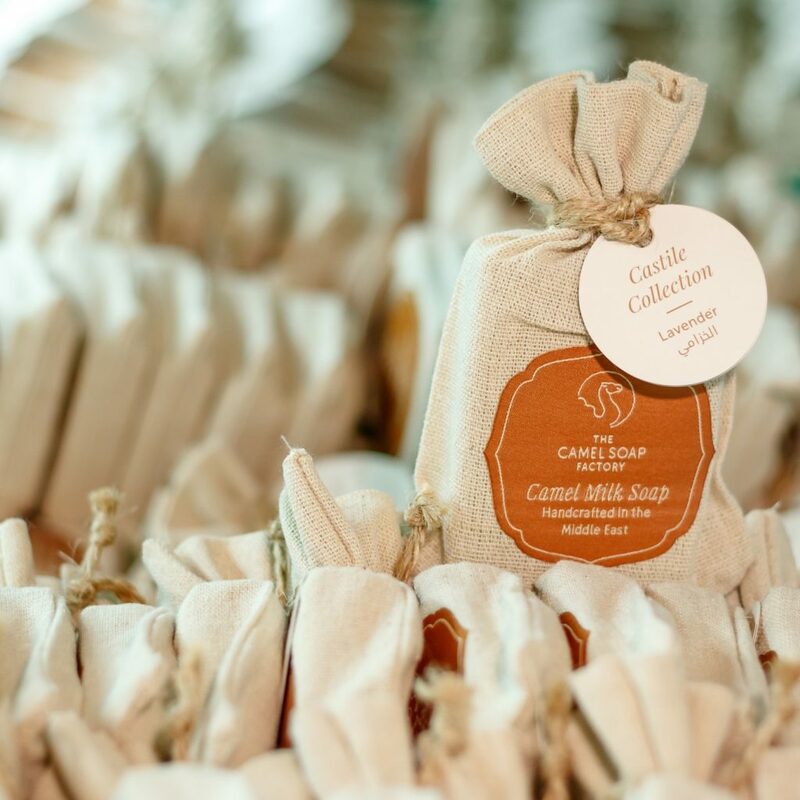 Camel Soap Factory offers customised soaps for wedding and corporate gifts and for hotels, with specific branding. Ever since demand for the product has picked up, the company is focusing more on ready-to-go soaps, with custom orders reserved for older clients. The company sells its products through market partners and online portals, and has not launched its own brick-and-mortar store yet. Lowmass is quick to point out that they are not too keen on the idea. Lowmass is keen on entering the Saudi market, including possibly setting up a manufacturing facility in the thriving nation, which would translate into a major leap for the brand. She is also keen on expanding business in China, plus to continue doing good trade in countries like Thailand and Sweden. For now, things remain busy at Camel Soap Factory and demand continues to rise. 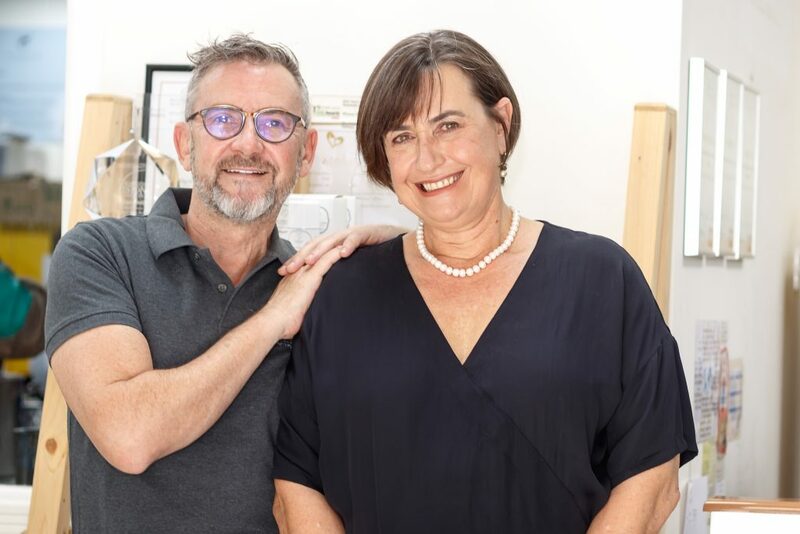 It is interesting to note how a home-grown brand has created a strong position for itself, not just as an organic product, but as a way of life. Talks of a bigger factory space emerge during our conversation, but one thing is apparent no matter the scale of the business, the soaps will continue to bear the loving, hand-touched warmth of the soap makers. Camel milk is considered closest to a human mothers milk. As a cosmetic ingredient, it is considered as a natural source of alpha-hydroxy acids, which help keep skin supple and reportedly prevent wrinkles and other anti-ageing signs. Vitamin A stimulates cell turnover, while Vitamin C, a natural anti-oxidant, increases collagen production and improves skin resiliency. Vitamin E protects the skin against cell mutation in the sun and pollution. Camel Milk is a natural source of essential fatty acid linoleic, known for moisture retention. The deeply moisturising lanolin in camels milk provides a calming and soothing effect and is beneficial for all skin types, including the most delicate and sensitive ones.